Menghai is famous for tea cake, and Xiaguan for Tuocha, where the traditional Pu-erh tea manufacturing method was born, also the most famous tea plantation area in Yunnan. 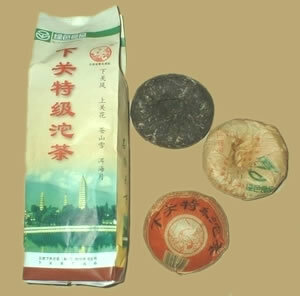 Xiaguan Te Ji Tuocha was recognized as one of the finest raw Pu-erh Tuocha in the world. The tea has a very refreshingly sweet aftertaste, it may be drunk immediately or put away for further aging.